Axtell and Argonia-Attica will battle for a spot in the 8-Man Division II state championship game to be played on Saturday, November 22 at Fischer Field in Newton. The fourth-ranked Axtell Eagles are two wins away from a state championship after not previously making the playoffs since 2008. The Eagle program battled the likes of traditional title contenders Baileyville B&B and Hanover as part of their past district schedule. Axtell’s seniors were freshmen during a 2-7 campaign in 2011. This year, Axtell’s only losses came to Hanover and St. Joseph Christian in Missouri. The Eagles are coming off a 42-34 victory over previously unbeaten Chetopa. Senior Shane Talbot does a little bit of everything for the Eagles. He has 482 yards rushing, 531 yards receiving, 109 tackles, and four interceptions. Quarterback Colton Buessing has completed 67 percent of his passes this season for 1,680 yards and 22 touchdowns. Buessing has also rushed for a team-high 636 yards and 17 scores. The third-ranked Argonia-Attica Titans are in the state semifinals after finishing 5-4 during the first season of the cooperative agreement between the two schools in 2013. The Titans have scored 140 points in their first two playoff games, but have surrendered 72. On Saturday, A&A held off Pike Valley 56-32. Junior quarterback Alec McDaniel leads the Titan offense with almost 1,400 yards passing and almost 1,400 yards rushing. He has passed for 28 touchdowns and rushed for 30 more scores. McDaniel also has recorded 141 tackles. Junior Devon Newberry is second on the team in rushing with 727 yards and 10 scores. Wallace County has made the playoffs every year since 2006; Victoria in each of the past 13 seasons. Since ’06, Victoria and Wallace County are each 1-1 in state championship games. One of these two teams will represent the west again this year to be decided by a high-profile matchup between the traditional powers. This marks the first meeting between the two schools since 2006, a 64-20 Victoria win in the sub-state championship game. Like this year, Victoria entered the game with one loss, while Wallace County was unbeaten. Victoria had a first-year coach, Doug Oberle, who was previously a Victoria assistant. In 2006, Jeff Hennick was Wallace County’s quarterback. Last year, Hennick returned home and served as an assistant under veteran Kevin Ayers before he took over this fall. Ayers, who now farms full-time, has remained a huge mentor for Hennick. Now, Hennick and Oberle will face each other as head coaches for the first time. The two squads are virtually identical. Victoria has averaged 8.1 yards per play and 314 yards per contest. Wallace County, which replaced a large senior class from last year’s runner-up squad, stands at 7.9 yards per play and 310 yards per contest. Victoria averages 215 rushing yards a contest, Wallace County 223. Knights’ junior quarterback Brady Dinkel has thrown for 897 yards and 17 scores and rushed for 845 yards and 15 touchdowns. Junior fullback Lane Kisner is expected to miss Friday’s game because of a broken leg. Kisner played on the injury in the second half against Hoxie and then had the leg checked on in practice last week. He didn't play against Minneola last Saturday. If Kisner is out, Joe Dortland will likely play tailback and Bryan Dome will make the move to fullback. 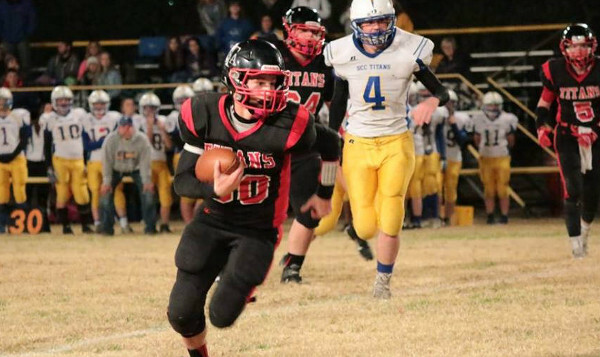 Wallace County junior quarterback Eric Gfeller, in his first year as a starter after he took over for his brother Kyle, has thrown for 868 yards with an 18/1 TD/INT ratio. He has rushed for 602 yards and 14 touchdowns. Junior linebacker Luke Schemm leads the Wildcat defense with 90 tackles, five interceptions and three returned for scores. The Wildcats have allowed just 82 points, by far the best in Eight-Man, Division II. Both squads have eight defensive/special teams scores. Victoria has played the No. 3 SOS in the classification, Wallace County No. 26. This is going to be a very close game, but the Knights hold a slight edge in experience and have the home field advantage.